in Influencer Marketing with tags Christine Mi, Influencer, Snapchat Both comments and trackbacks are closed. Many people consider themselves lucky when they draw something remotely discernible on Snapchat. 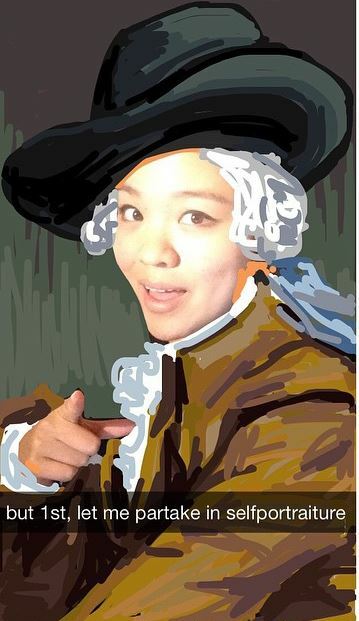 Snapchat artist Christine Mi doesn’t face this challenge. What started out as playful touches to her snaps – a mustache there, some glasses here – has now transformed into full out artwork. 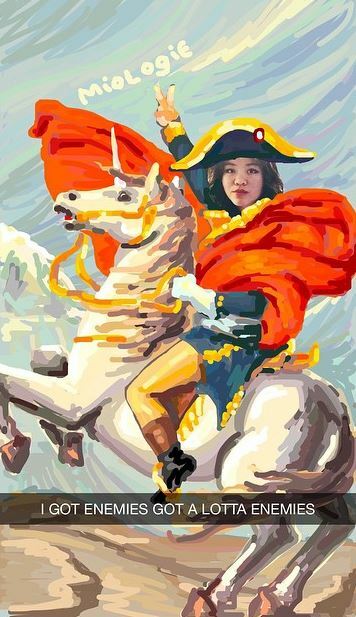 Christine features herself in most of her work – transforming herself into Vincent Van Gogh or Snow White – but also hosts Snapchat battle stories like her most recent Pokemon story. Christine recently joined 360i for its WOMMA #WineWednesday event, where during the panel discussion she emphasized the importance of giving influencers creative freedom. We caught up with Christine off stage to further the conversation around Snaps, where the platform is headed and brand partnerships. 360i: What inspired you to start creating Snapchat art? CM: Like what many people use the platform for, my first Snapchats were quirky selfies for my friends. Then I started adding little things: beards, mustaches and glasses. I’ve always loved to make art, so playing around with drawings on Snapchat came natural to me. I think it was when I discovered Snapchat’s full color palette that I really got started with creating Snapchat art. It evolved into a fun hobby and stress reliever – I’d see a character I liked and try to recreate them on the platform – and once I started I couldn’t stop! 360i: What are some of your favorite creations? CM: My personal favorites are my art history Snaps. I like to think there is a deeper commentary in the juxtaposition of old and new mediums of art – but I also really just think they’re funny. 360i: What kind of content do your fans respond to best? CM: My fans particularly respond best to content that they can engage with like stories where they can help choose the narrative and the outcome of cliffhangers. For my Pokemon battle story, for example, I let fans choose the opponents and victor, and they seemed to have a lot of fun with that. I love that Snapchat is as much about communication as it is about exhibition – it’s rare to see that level of bi-directionality in social media. 360i: How long does it take you to create each snap? CM: It really varies! Usually between 20 to 90 minutes, depending on how ambitious I’m feeling. Thinking of a clever caption can sometimes take longer. 360i: Snapchat recently announced a big update to the platform. Where do you hope the platform goes next? CM: I really hope that the next step for Snapchat is discoverability of user-generated content. The current discover page is great for publications, but I’d love to see a way for people to find entertaining and organic content by storytellers, artists, personalities and brands. A clearer way to track metrics and analytics would be useful, too. 360i: What should brands keep in mind when leveraging Snapchat? CM: I think the most important thing for brands to keep in mind is the importance of staying native to the platform. It can sometimes be difficult to make sure the way you communicate with your audience doesn’t feel too polished or forced on the platform. The key to Snapchat is staying down-to-earth and relatable – don’t talk at your audience, but instead have a conversation with them. 360i: What do you look for when evaluating brand partnerships? CM: I really value a partnership that is collaborative, not controlling – which allows us to come up with creative, unique ideas together. Before taking on new work, I also ask myself a few questions: Do I agree with the message of the campaign? Is there synergy between the brand’s voice and my own voice? What are their goals and how can I help them achieve them? To view more of Christine’s work, follow her (@miologie) on Snapchat, Twitter, and Instagram, or visit her Tumblr.